The morning Immersion session is now full. We hope to have another CM event this summer, so please be on the watch for that event! There are still plenty of spots for the afternoon CM High School workshop and you can still register for that below! In order to provide the best learning atmosphere, this event is limited to 25 attendees so that everyone can participate in the learning and narration. ​ Don't delay in registering. It will fill quickly! 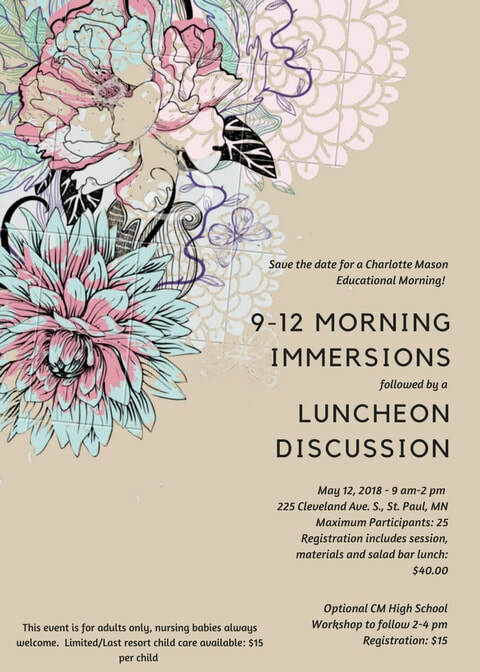 Please join the Twin Cities Charlotte Mason Community for a Morning Immersion Seminar about the educational principles and methods of Charlotte Mason. Whether you homeschool, your kids are in a school, you just have preschoolers, you are an educator or just love helping kids, this will be a time to gather lovely ideas that will really get you thinking about what a Christian, Living Education can look like. Morning Immersion (9-12): Immersion Sessions will topics such as Poetry, Bible, (History)Narration, Artist Study, and Nature Study, etc. Official Topics will be announced soon! During Immersion Sessions Adult Attendees will participate as students so you can experience what these lessons are like. The entire morning will be run like a school morning. Lunch Discussion(12:15-2): During Lunch you will have an opportunity to discuss and ask questions about the Morning Immersions. We'll discuss what Mason was doing in the PNEU for High School and about PNEU, Scheduling, Transcripts, and try to brainstorm together. This session will be a discussion and a way for us to discover together how we might approach High School Planning. I am right in the thick of it with you all, so I come humbly to lead the session and plan and think together! You may come to either the Morning session and Luncheon Discussion 9 am - 2 pm ($40) or High School Workshop ($15) or Both. We hope you come for both! Members of CityLife Church will receive a $5 discount on each event - Total cost: $45 for the day. ​We look forward to this relational day of sharing ideas with you so you can Spread the Feast for your children! This event is not for children, but for adults to gain confidence in using Mason's Life-Giving principles to teach your children. Nursing Babies are always welcome. Limited and Last Resort Childcare will be available for $15 per child. You will need to e-mail heidianderson@hotmail.com to request this and pay at the event. ​Hope to meet you there! YOU CAN REGISTER HERE FOR THE MORNING SEMINAR and LUNCHEON/DISCUSSION as well as the High School Workshop! Just a reminder that this event is Limited to 25 attendees for an optimum learning environment. Registration will close when this number has been reached. Please indicate below whether you intend to attend the morning session/lunch, the High School Workshop, or both. The morning session/lunch is $40. The High School workshop is $15. If you attend both please write a check or do your Paypal payment for $55. Also, please include your e-mail, home address and phone number. Once I receive your check or paypal payment, I will send a confirmation e-mail as well. Thank you! In order to save your spot and officially register you need to fill in the online form below and ALSO Pay the Registration Fee. To pay, please either MAIL IN your check (made out to Heidi Buschbach) to 3000 Leyland View, Woodbury, MN 55125 or Pay your fee through this Paypal link.